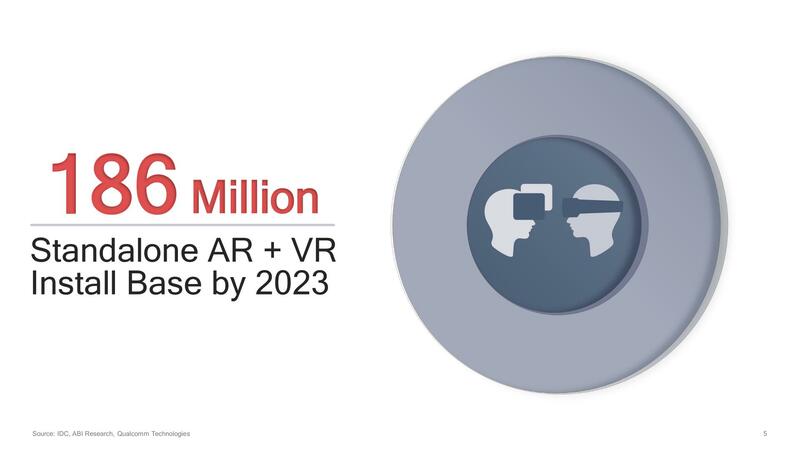 For the better part of the past few years now, Qualcomm has been making a serious and concentrated effort to establish themselves as the dominant player in the mobile VR space. And as the first generation of standalone VR headsets have come out, those efforts on both the hardware side and even more on the software/dev support side are finally paying off. Rivaled only by Samsung’s phone-based Gear VR system, if you’re using a standalone VR headset today, it’s almost certainly powered by a Qualcomm Snapdragon SoC. Now amidst the backdrop of the annual Augmented World Expo, Qualcomm is taking the next step on the hardware side of matters. This evening the mobile juggernaut is announcing their first dedicated VR/AR/XR platform/SoC, the Snapdragon XR1. The XR1 is Qualcomm’s first purpose-built silicon for what the company is dubbing eXtended Reality devices, a catch-all term for virtual/augmented/mixed reality. The creation of the platform means that Qualcomm feels the market for standalone headsets has finally grown enough that it’s reached a point where they can justify the costs of a dedicated platform, including the silicon engineering and even more expensive developer and consumer relation campaigns that go with it. In that sense everything up until now has been the company laying the groundwork for this moment – and not that Qualcomm hasn’t been serious up until now – but this marks a significantly higher investment on their part than their efforts up until now. 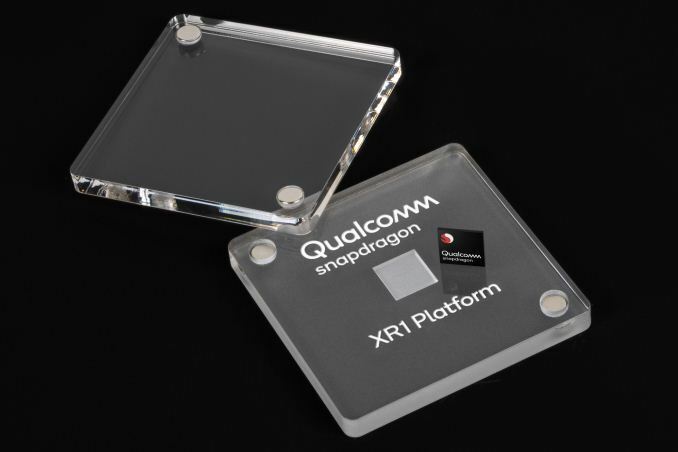 The XR1 is, in turn, part of what is becoming a two-pronged strategy for Qualcomm on the XR SoC front. 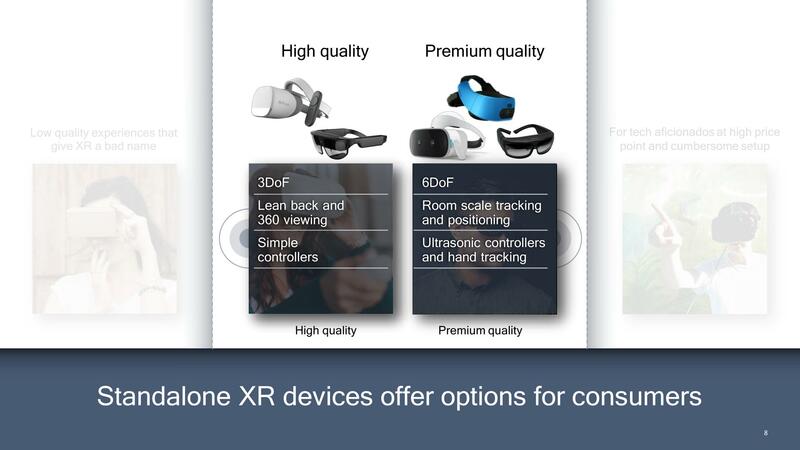 Qualcomm sees the mobile headset market as encompassing three markets: entry-level “cardboard” devices used with phones, “high quality” but economically priced 3DoF headsets like the Oculus Go, and then “premium quality” 6DoF headsets like the Lenovo Mirage. Of these three groups, Qualcomm intends to go after the latter two. For the best experiences, Qualcomm will continue pushing their flagship-class (and flagship-priced) smartphone SoCs like the Snapdragon 845. However for devices like the Oculus Go and other headsets, where cost is a greater concern and vendors are okay with trading-off features to meet mass-market prices, this is the territory Qualcomm is going after with the XR1. In practice then, the XR1 is a successor-of-sorts to the Snapdragon 821 and other older SoCs that have been tapped for these first-generation headsets. It replaces relatively cheap-but-aging SoCs with even cheaper silicon purpose-built for XR headsets and headsets alone; smartphones need not apply. As far as the XR1 SoC itself goes, today’s announcement is a bit of a mixed bag. 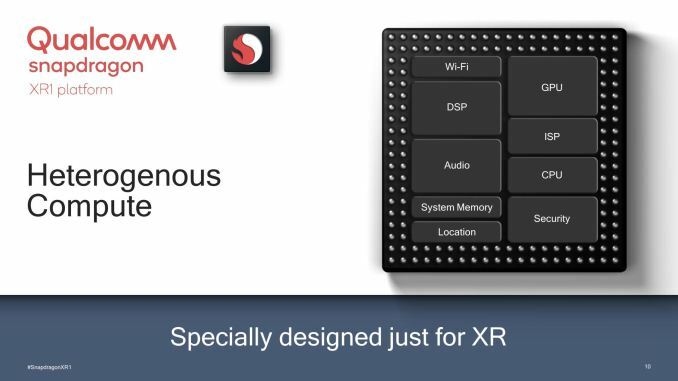 Unfortunately Qualcomm is not disclosing the specifications of the SoC at this time – so information on the CPU cores used, GPU configuration, etc – are not going to be revealed until closer to the launch. But they are, at a high level, laying out their design and product goals with the XR1, and in the process making some confirmations about what the forthcoming SoC can and cannot do. At a high level, the XR1 can be thought of as a stripped-down version of a traditional Snapdragon SoC, eschewing the smartphone-specific hardware such as the modem. 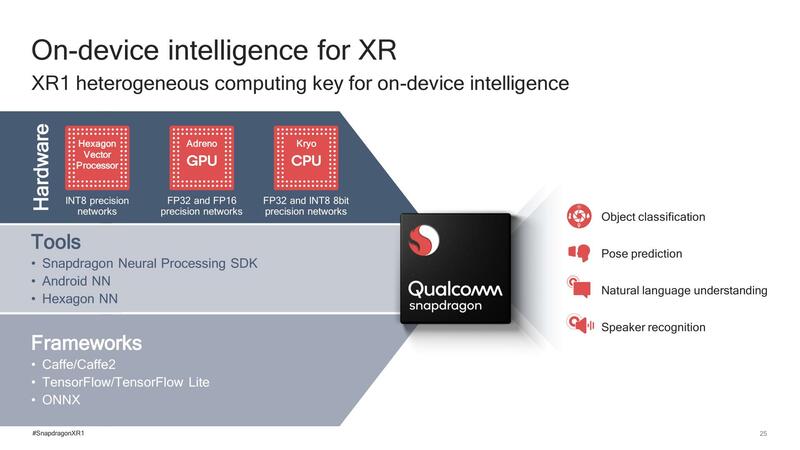 While Qualcomm isn’t outlining the specifications of the chip, if you’re familiar with the building blocks they use for other Snapdragons then you know where this is going: a Kryo CPU block, an Adreno GPU block, a Spectra ISP block, a Hexagon DSP block, etc. At this point I would expect all of these blocks to be based on Qualcomm’s latest-generation tech – so 600-series Adreno GPU, for example – however Qualcomm says that they are tailoring the platform’s performance for the market, and based on some off-hand comments I suspect we’re also going to see other optimizations such as a narrower memory bus. Which is to say that this isn’t going to be a SD845 with the modem taken out and nothing else. It does need to be powerful enough to deliver meaningful VR experiences, but Qualcomm is certainly looking at just how powerful – or perhaps unpowerful – a SoC needs to be for this market, in order to keep costs down. 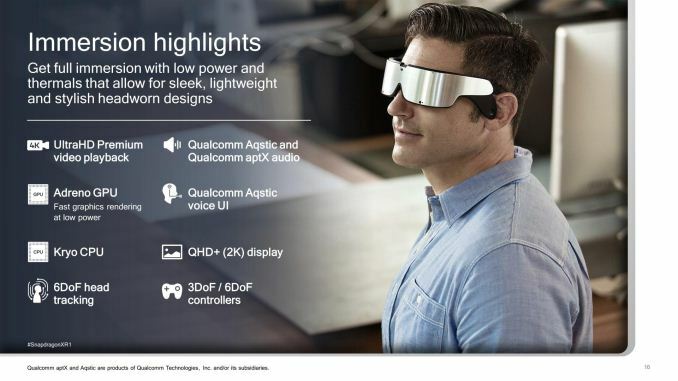 Overall then, Qualcomm is positioning the XR1 to drive headsets up to 4K(ish) resolution, a step above the current Oculus Go (1440p) and an unsurprising fit given that their video decoder can also handle up to 4Kp60 video. And while the company’s initial examples of headsets have focused on 3DoF tracking, this is for overall device cost reasons. The XR1 platform itself can handle 6DoF tracking as well, if a headset vendor wishes to spend more to include the necessary sensors. In my pre-briefing with Qualcomm ahead of the show, the company’s representatives also briefly spoke about power optimizations for the new platform. These are as much software as hardware, but there’s a certain realization that these devices are going to be running under heavy, sustained workloads for longer periods of time. So the burst-and-throttle nature of smartphone SoCs won’t work for XR headsets, both for battery life reasons and heat reasons. This places a pretty heavy emphasis on the XR1’s GPU block, as under sustained loads that’s likely to be the biggest consumer of power. This also means that Qualcomm is putting a bit more focus on heterogeneous computing, and “AI” in the roughest sense. Mostly as being power efficient means that Qualcomm can’t rely on the CPU or GPU for everything, and needs to make good use of the Hexagon DSP as well. This still feels a bit like Qualcomm being in search of a nail since the hammer of the day is AI, but in talking with the company, I do have to agree to at least some extent that the restricted views of these headsets mean that there’s more opportunity for voice commands here than there has been on phones. 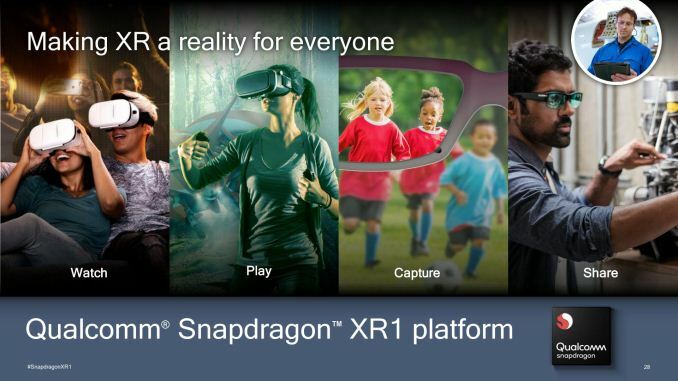 Overall Qualcomm’s pitch for the XR1 is rather focused on video, and for good reason. Using the Oculus Go as a template, video has certainly been the most convincing use case for that headset, in part driven by the practicalities of using the Snapdragon 821 SoC and only sporting 3DoF tracking. So for the first headsets based on the XR1, video is similarly expected to be the biggest use case. Which is not to say that the XR1 won’t be up to the challenge of rendered VR tasks either, as Qualcomm is clearly taking efforts to make that possible without blowing their power budget. But the current state of 3D rendered VR on mobile platforms is shaky, even on flagship-class SoCs. So similar to the Oculus Go or even some of the SD835-based headsets, rendered worlds are not going to be the strongest experience of these headsets. As for AR, it remains to be seen. The company is promising a motion-to-photon latency of under 20ms, and the company’s Spectra ISPs are nothing to sneeze at. But these does stand to be the hardest market to break into, both for headset cost reasons and because it’s the least well developed in terms of consumer use cases. Not to mention VR-with-cameras will be going up against projected overlay technology ala Microsoft Hololens. Wrapping things up, along with today’s product announcement, Qualcomm is also announcing that the XR1 is already near completion. 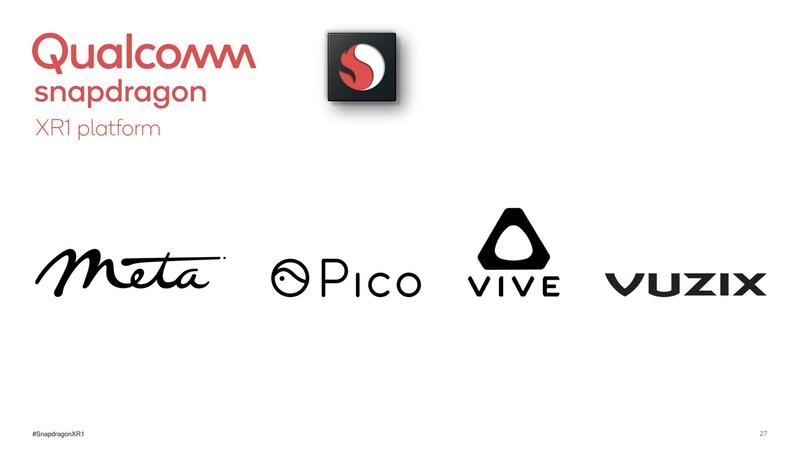 The company has already signed on four partners for VR headsets, including not only frontrunner HTC Vive, but also Pico, Meta, and Vuzix, with the goal of not just shipping the XR1 SoC this year, but getting consumer headsets on the market by late this year. In which case we should be seeing designs from those partners very soon. > based on some off-hand comments I suspect we’re also going to see other optimizations such as a narrower memory bus. In a VR-specific SoC? That's nuts! "Also, I don't get why they'd eliminate the modem." Because it's not needed for a VR headset, and it adds quite a bit of cost in terms of the actual die area, the radio RF frontend, and then all the licensing fees (which admittedly go back to Qualcomm). Network connectivity is going to be essential, for both AR and most VR experiences. Since there won't always be open wi-fi, you're either going to need the modem or a smart phone on your person. Mark my words: we'll see the return of the modem as an essential ingredient in AR (and probably VR) SoCs. I get why they took it out, but that's not going to last. Once AR glasses become competent substitutes for a smartphone, the modem will be back. 4G adds cost, power, heat, a huge amount of mechanical volume and you don't need LTE for VR, VR is indoors only. Not that you could afford it, what are you gonna do, stream Netflix in 4k over LTE? The experience is not connectivity focused either. With AR you need connectivity but if it's a slim pair of glasses (not indoor only like hololens) but LTE does not fit well at all for now and folks wouldn't pay for a data plan if functionality is limited. If you have 200$ glasses for driving or cycling, you are not gonna pay for a damn data plan. Short term yes if you define glasses as they are today but medium term and beyond, a 5W phone SoC is not fit for the form factor at all. We need glasses that look like a normal pair of sports glasses or better. So any glasses that can achieve very high volumes will have to use much more efficient SoCs and focus more on accelerators. Funny you should say that, since one of Google's first ads for the Daydream standalone HMD shows a girl using it in what appears to be her back yard. AR glasses likely won't replace smartphones to any significant degree, as they're not nearly as well suited for the most prevalent uses of smartphones: web browsing, social media, and similar apps. Eye tracking, hand tracking or other gestures will never match the speed and accuracy of touch, and while having a display projected "in front of" your eyes is really neat, it's also quite inflexible and impractical in a lot of situations. AR glasses might act as a supplement or add-on to a smartphone, but the cost of a second device would make that a niche concept.